Jeanne here today! 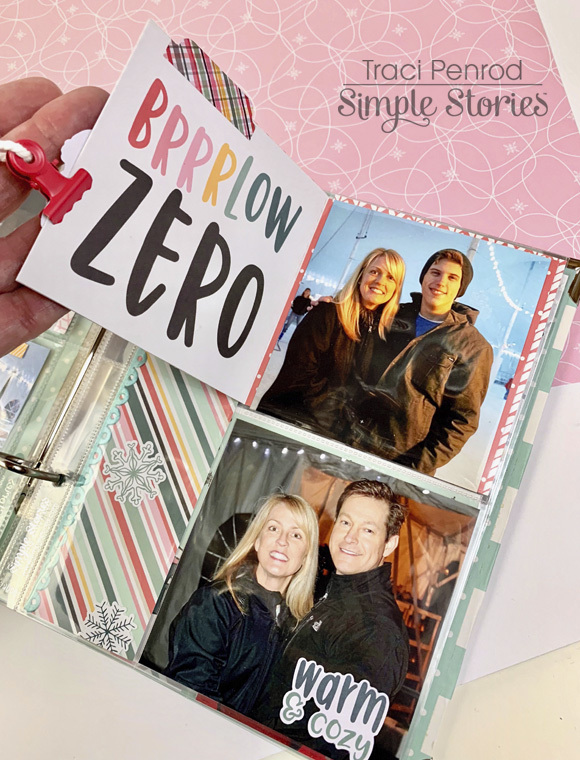 I’m so excited to share projects made with the Simple Stories Freezin’ Season collection! The weather outside might be frightful, but inside crafting is totally delightful! The Collection has everything you need to make, make, make! The papers are pretty pink and coral, teal and navy with pops of yellow and green. It's absolutely wonderful! The Chipboard Stickers, and printed die cut Bits and Pieces are easy to work with. Because they’re already cut out all you need to do is arrange them. I spread them out all over my work surface and position them on clear sheets of plastic the same size as my card base. It’s easy to pick up the arranged sheets and lay them over different patterns of paper to help me choose which one I like best. You’ll love the snow theme and different elements that make creating a scene easy. To make hills and snowy drifts I cut waves with scissors. Mixing light and dark pattern papers for backgrounds adds depth and dimension. I tucked the Bits and Pieces pine trees and mountains behind the drifts, and used the circle snowflakes as a sun in the scenes. There’s so much to love with the Simple Stories Freezin’ Season Collection! The cuteness will make you smile and fill your hearth with warmth. Hello! Iris here sharing another layout I made using the wonderful Merry & Bright collection. This time I was going for a clean, modern look, on-trend with the farmhouse style. To do that, I started off with a white cardstock background. This one is a Swiss Dot texture from Bazzill. (You can get this on Amazon or at Joann's) Then I downloaded three separate Simple Stories word cut files from the Silhouette Store. (Peace: Design ID 67976; Love: Design ID 80540; Joy: Design ID 67980) I welded them together to make my title. I have been obsessed with buffalo plaid and it’s all over the place in Christmas decore, so I first cut my title from the B-side of the 4x4 Elements paper. Then I used the offset function in the Silhouette software to create an outline that I cut out of plain white cardstock and I adhered it on top of the buffalo plaid words. I printed my photo as a 3.5”x5” in black and white because it was dark and reddish-brown toned. The black and white elevates it, and lets you focus more on the subject than all the color. Behind the photo, I layered a tiny bit of tissue paper, a sliver of the green plaid paper from the 6x8 paper pad peeking out on two sides, a doily, and a brown paper bag with a torn top edge. Then I added a cluster of stickers, chipboard, and puffy stickers at the bottom left corner. I concentrated on icons that felt like the farmhouse style - the tree which echoes the plaid from the right, the galvanized vase of foliage, a couple word stickers (love the mix of fonts), a puffy star, and the banner of lights to go with the lights you see in the photo. For interest, I tucked some thread under the layers. Having the buffalo plaid in two spots, I completed a visual triangle by adding the last bit of the scalloped border sticker from the Combo Sticker sheet. I could use that on every layout and be happy! I’ve never been one for poinsettias, so I was thrilled to see this collection also has a lovely red flower that looks more like a peony, and I used that motif throughout my design. Another word sticker and puffy star complete a cluster at the bottom. And the “love” in that sticker repeats the “love” of the title, which ties things in even further. The large cut title is a prominent focal point, so I kept things simple around it by adding just another flower, word sticker, puffy star cluster at the top where it intersects the photo, and another flower on the last letter. The flower sits atop a loop of thread. This decorates the area where the journaling is nestled in, and is complimented with a couple more puffy stars. I turned to one of my favorite journaling looks - typed on vellum - to keep this page looking clean, light, and airy. I welcome you to check out my Youtube channel for the process video, which includes the steps I did to make the cut file title. There is a wonderful selection of words in the Simple Stories designs at the Silhouette Store that you can play with to match and compliment all the SS collections! I can’t get enough of the Merry & Bright collection. You can make a layout with a classic feel, or one that looks completely fresh and modern. It’s such a versatile collection that will help you scrap tons of Christmas holiday memories! Hi everyone, it is Kelly here and today I will show you how I have setup my December traveler’s notebook (TN). 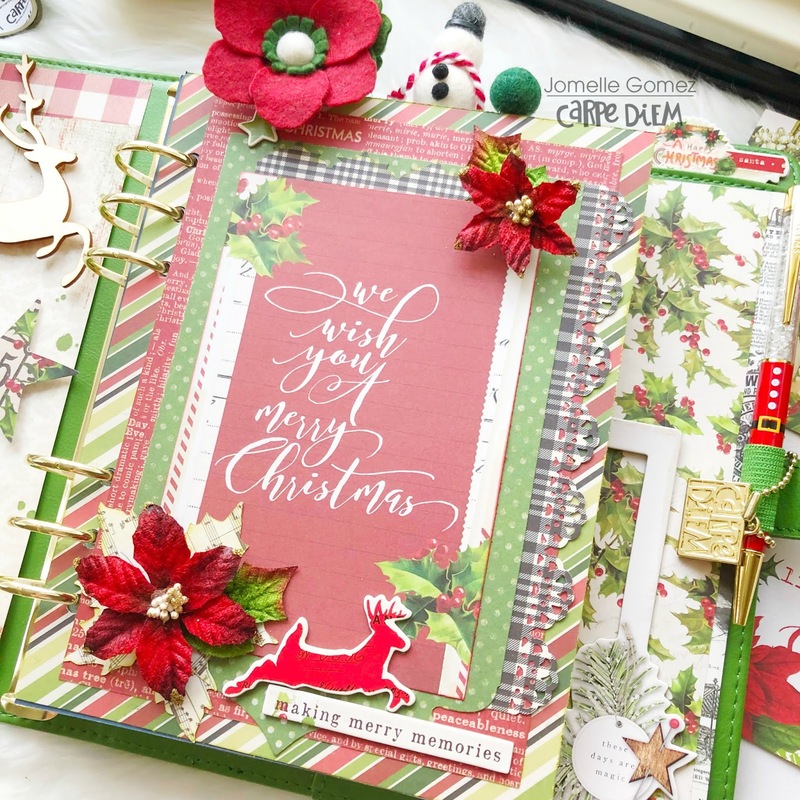 I used the Carpe Diem Cream Dot TN and the Merry & Bright collection by Simple Stories. 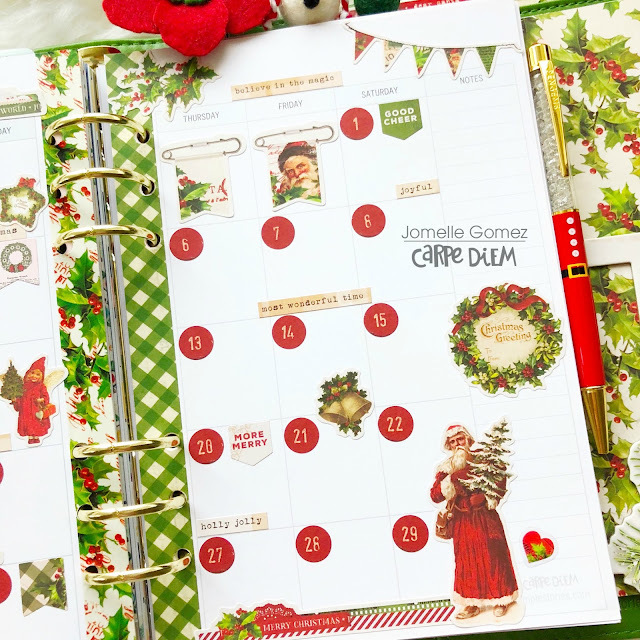 For my monthly spread I printed the monthly December overview from the December free printables at the Simple Stories website. I printed the two monthly pages on plain printer paper, cut them to size and glued them on blank note pages. 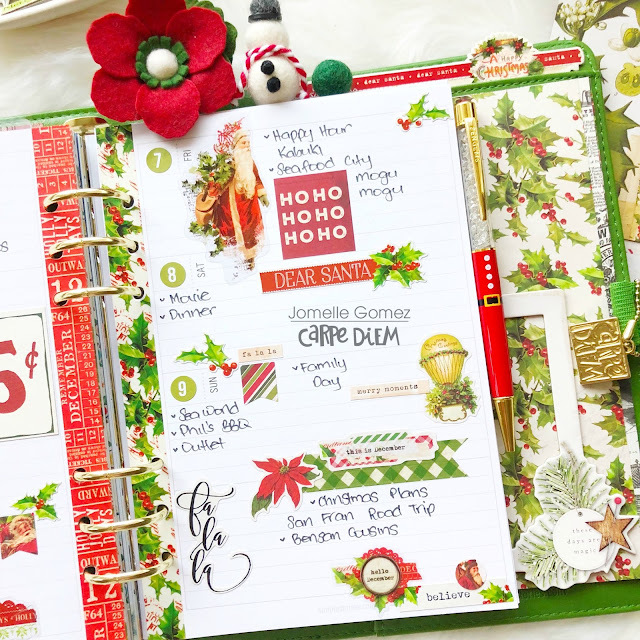 I decorated the spread with washitape and lots of stickers from the Merry & Bright collection. From the backsides of the 4x4 Elements paper and 4x6 Horizontal Elements paper I made TN covers for my monthly insert and weekly insert pages. I decorated the second cover with a 3x4 card and floral and word strip stickers from the combo sticker page. I used a few pages from the weekly TN inserts and decorated the weekly spread in the Christmas theme. I used decorative stickers and pieces from the Merry & Bright collection and some red and green functional stickers from the Basics sticker tablet. I also laminated a little 3x4 card and made a little Christmas washicard. I wrapped some of my favorite Christmas washitapes around it. For the second weekly spread I used stickers from the December page from the Seasonal sticker tablet. These stickers match the free December printables! I hope you enjoyed reading this blog! Check out my instagram for more inspiration Have a nice day! HI! Odessa here with some very Merry & Bright pages! It feels like everyone is working on all things December and it’s so much fun. I just finished up my album from last December and I can’t believe how easy it was. I had about 18 pages left to do, sat down to do a couple and ended up finishing the whole album. It was so easy with Merry & Bright. Working with one collection makes it really easy to put together pages that work. Everything goes together! Merry & Bright is the perfect balance of a traditional Christmas look with a touch of fun that was just perfect for me. I added the cute scalloped border sticker from the Merry & Bright combo sticker page and a tab on the edge of the flip, I really like how it turned out. It makes it a little more obvious and a lot more fun to flip. 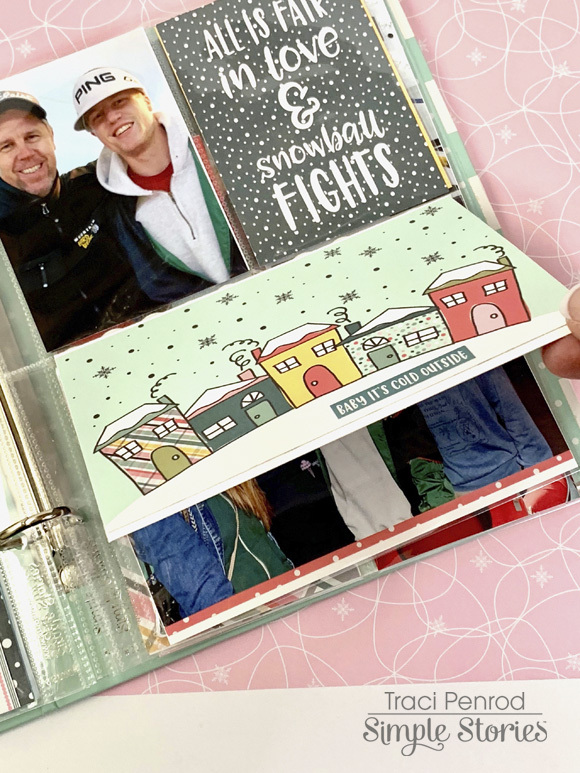 Under the photo flip is some journalling in one of the frames from the Merry & Bright tags and frames pack along with all the cute embellishments. I just love those puffy sticker stars! Here’s another layout I put together with Merry & Bright. I used a combination of SN@P! cards, stickers of all types and bits and pieces to embellish my pages. The big Merry & Bright numbers might just be my favourite thing from the collection. They’re the perfect size to slide into a 3x4 pocket or add to a bigger pocket or page. Here I embellished a journal card with a big number, a phrase sticker that suited the layout and another cute puffy star. Sometimes I have pictures that I really like but don’t tell much of a story, like this succulent one. This page goes with another page about a day at a greenhouse and I really liked the colours in it so I had to add it in. 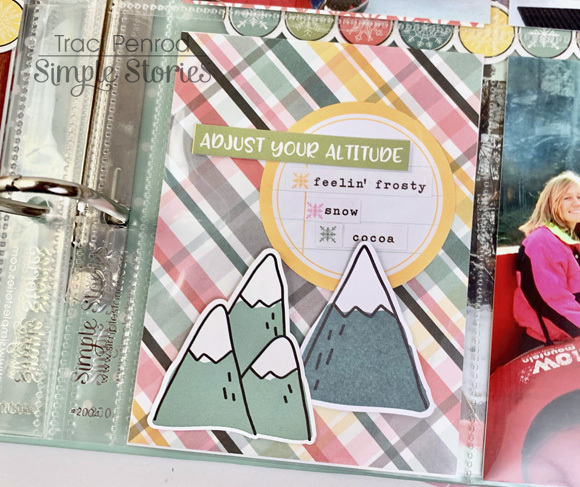 By adding a focal chipboard sticker and a word phrase it acts like filler journal card in my album and makes for a nice pocket. I’ve been loving seeing what everyone has been crafting with Merry & Bright! I hope you enjoyed this peek in my album. Hello, my name is Cara and I’m a December Daily drop out. I’ve tried, I really have. I have a few albums where I’ve documented my December, but mostly, my albums sit half finished. I’ve tried to finish them in January and that did work… a bit. For two years now, I just haven’t been able to finish. I want to do it! I LOVE the look of a pretty December album, but most importantly, I want to have all those wonderful December memories documented. There are so many wonderful things going on in this fabulous time of the year and it all seems to rush by in a split second, so documenting it has helped me not only savour it more in the moment, but also to relive it again as I document it and then again whenever I look back at the album. So, the best alternative that I’ve found for me this year is to simplify, and here is what I’ve come up with. I’ve added an extra insert to my Dream TN (check out my last post HERE to find out more about that TN and the other inserts). This new insert is basically a fancy journal that magically takes away my December-Daily-dropout guilt and also takes away the pressure to make it perfect. Also without having to remember to take photos, editing, printing and sticking everyday, the process is quicker and so much less daunting. I can always use the photos I do take… or not. I love that there is no pressure or obligation. Don’t think that it’s too late to start! There are still more than 10 days before Christmas, that’s a lot of memories you could record. So let’s get to it! I'll use the same simple design for each of the 25 days. Some pages have 2 days in the 2 page spread. I know we will have more going on some days, so I left the 2 pages of the spread for that one day. Regardless, the design is similar. Use a design that suits you and feels easy for you. I started with the big round numbers from the Numbers Sticker Tablet, then I added a strip or two of Christmas washi, either a die cut (from the free printables, I’ll talk about those in a sec!) or a large sticker from the Seasons Sticker Tablet. Then, I layered smaller stickers from all the Sticker Tablets. I also added a cluster either next to the number sticker or in another corner or both! This design is quick for me to make, looks adorable and still leaves lots of room for writing, it’s simple and perfect for me this year! Let’s just take a second here to talk about how stinkin’ awesome these printables are! 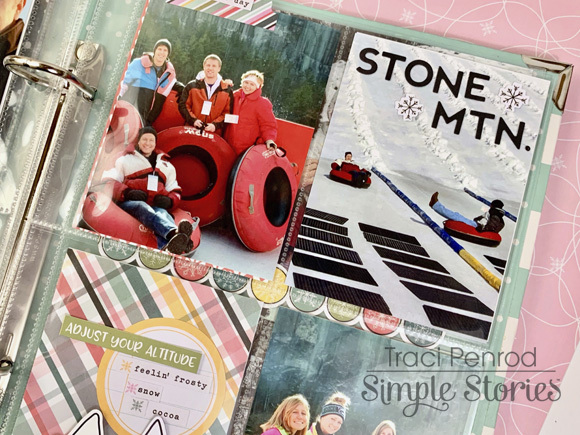 Every month there is a set of cute printables that match that month’s page in the Seasons sticker tablet, you have A5, personal and TN options, plus you can resize before printing to fit your needs. Did I mention they are super cute, and FREE?! Amazing, right? There is also a bonus set this month for Christmas, You can find both of those sets HERE! Ok, let’s get back to that cover! Washi and stickers from the tablets give the cover a finished, polished look. I used some of the full page printables to fill some of the leftover pages. Simple and quick and that’s just what I’m looking for, creating this TN. My printer messed up (or I set it wrong, more likely) and I had two that were printed on opposite sides of the same page, but one was upside down, so I used some washi to attach it to the top so that it could flip up, making it right side up! If things get busy, and, come on it’s December, so being busy is pretty much a given! I’ll take notes either on my phone or on a sitcky note until I get a chance to write it in. And these ones from the Bloom collection are sooo pretty and they actually stick! Don’t you hate it when you’ve bought pretty stickies only to have them fall out of your planner and get lost? Not with these Carpe Diem sticky notes! I’m going to be doing a live flip through of my December journal today at 10am EST, so whether you are a December Daily dropout or not, join me at the link here: Cara's YouTube Channel - The replay will be at that same link. Happy planning and happy holidays! I have always loved a grid layout. It's easy and great to use with those 3x4 element cards. This collection is filled with beautiful festive images including Santa, snowmen, poinsettias, and so much more. I used 2 photos measuring 3x4" of my nieces. This picture was taken a few years ago. I think it's time for another photo shoot if they would just cooperate... Teenagers! 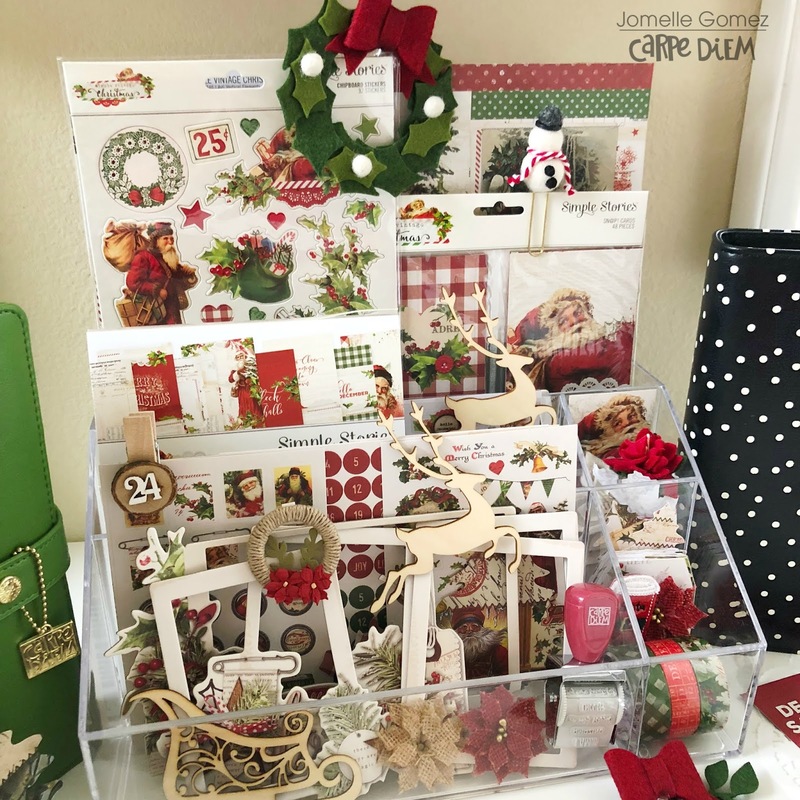 Marcia here today with a festive Christmas layout I created with the Simple Stories Merry & Bright Christmas collection. Does your family do a photo shoot for your annual Christmas card? I don't know about you, but I love receiving photo Christmas cards! I like to see how much kids have grown and seeing how other family members have changed. I scrapped my sister-in-law's family for todays layout. I love how her Christmas card photo turned out! I am still hoping to get some family photos done myself, but with adult kids that work odd hours, it might not happen until Christmas! Anyway, every year for Christmas my Mother-in-law asks for the same thing ... a scrapbook album full of family photos. This layout is going into my Mother-in-law's album. 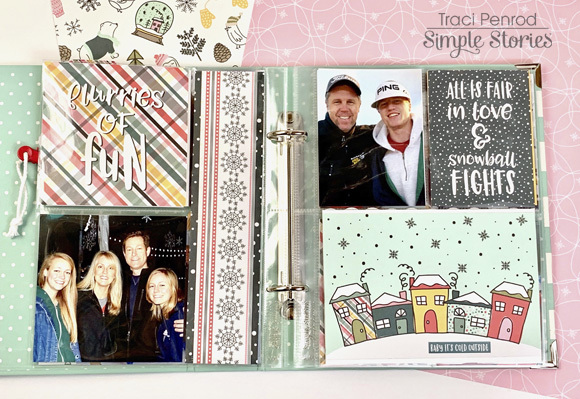 The Merry & Bright collection is perfect for documenting all of those holiday family photos! Is there anyone besides me crushing on all these plaid papers? That black and white buffalo plaid is the perfect background for this poinsettia wreath cut file by Paige Taylor Evans. The wreath frames my family photo nicely. The cut file was backed with various pattern papers from the Merry & Bright collection. I love how the reds and greens in the pattern papers coordinated so well with the colors in my photo. There was also a soft blue that worked well for the bells and an awesome plaid pattern paper that I used for the bow. With such an ornate cut file, I kept my other embellishments to a minimum. I just wanted to add a few things around my photo like this fabulous JOY banner and the Peace Love Joy tree from the Tags and Frames pack. That cute candy cane is one of the puffy stickers ... and don't forget to add a date so you'll remember years from now what year that was. The 4x6 sticker packs have the perfect round stickers to do just that. I wish you the happiest of Holidays.Thanks so much for stopping by today! Have an awesome week. I absolutely love the NEW Kissing Booth line!!! The colors and patterns are adorable!!! Once your Christmas shopping is done relax and make some Valentines Cards!! I love this cute cupcake chipboard!!! These cards were made using the Kissing Booth Chipboard and the collection kit! Pick some up today and get started on some darling cards!!! We will be making all of these cards at our Scrapbook Retreat in Salt Lake City in January. Follow our Facebook page Mom and Me Scrapbooking for more information. Hello creatives! Leah here with you on the blog today. I’ve started setting up my December TN using a blend of the Freezin’ Season and Merry & Bright collections. 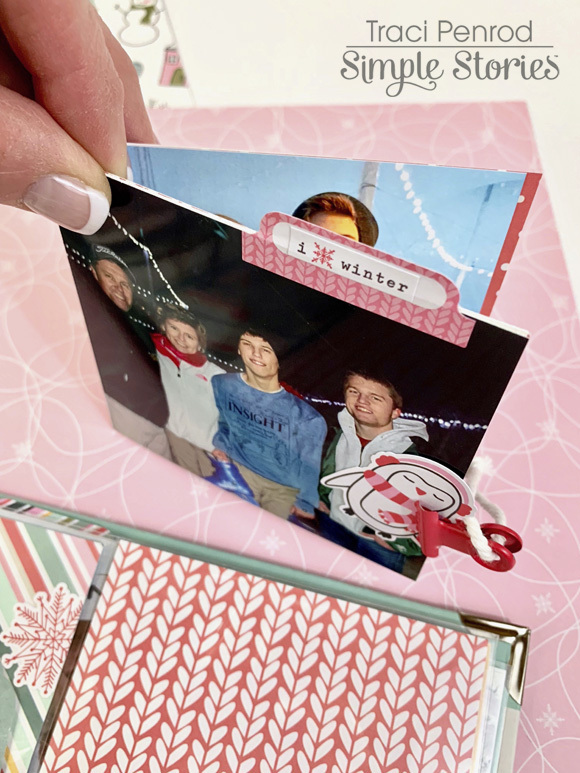 In my previous December Daily projects (learn more about this memory-keeping project started by Ali Edwards here), I have typically stuck to a more traditional Christmas color scheme. This year, I wanted to blend in some less conventional colors like those in the Freezin’ Season collection. This collection is designed to have more of a general winter theme, which fits the wintry season but doesn’t have as many holiday sentiments as the Merry & Bright collection, so I’ve decided to blend both collections for my December setup. Both collections have softer blues, greens, and reds which makes it easier to mix and match pieces from each. I’m using the Typewriter Circles Traveler’s Notebook to house a couple of inserts this year. One will function as my December Daily album and the other is where I’m keeping all my notes and plans throughout the holiday season. I like keeping these two notebooks in one place because I often find that the planning and lists I make during December can often be easily incorporated into the story I’m telling that day from a memory-keeping perspective in the December Daily. I’ve prettied up my TN pockets and December Daily cover using primarily the Freezin’ Season collection. I used some of the cards from the 3x4 Elements 12x12 paper, lots of die cuts from the Bits and Pieces pack, and a few chipboard stickers. I learned last year that trying to do a December Daily album in a TN introduces a fun challenge in trying to be mindful not to add too much dimension. Otherwise it can get very difficult to close the notebook before the end of the month. One of the tricks I like to use when I want to add the illusion of dimension without adding extra bulk is adding hand drawn borders around some of the décor pieces. In particular, if you are layering a light colored element over another light colored element, you can establish some contrast by drawing a black border around the front piece. This gives an effect that the front piece is popping up away from the background slightly and therefore adding more dimension. I have also found that adding borders to loose or “floating” layers can really help anchor them and make the finished project feel more finished – but then again, that could just be part of my style and preference. I love the handmade look of doodled borders. Bonus clip (literally)… I used a few scraps leftover from pocket pieces I had trimmed down to make this adorable clip! On the front cover of my December Daily insert, I had so much fun adding lots of layers and texture because the cover is one of the few pages of my December Daily where I don’t have to worry about the bulk preventing the album from closing. I used the black and white side of the “Snowed In” 12x12 Paper from the Freezin’ Season collection as my background. I added some watercolor paint to my background and then went over it with a layer of white gesso to soften the colors so they blended into the background more instead of competing with the décor I planned to add on top. For the next few layers, I added a doily and a tag I made using some of the Freezin’ Season patterned papers. I then started layering in die cuts, chipboard stickers, and several stickers from the Freezin’ Season Combo Sticker Sheet. I made sure to tuck the smaller pieces over, under, and in between the doily and tag layers to give more texture and visual interest. 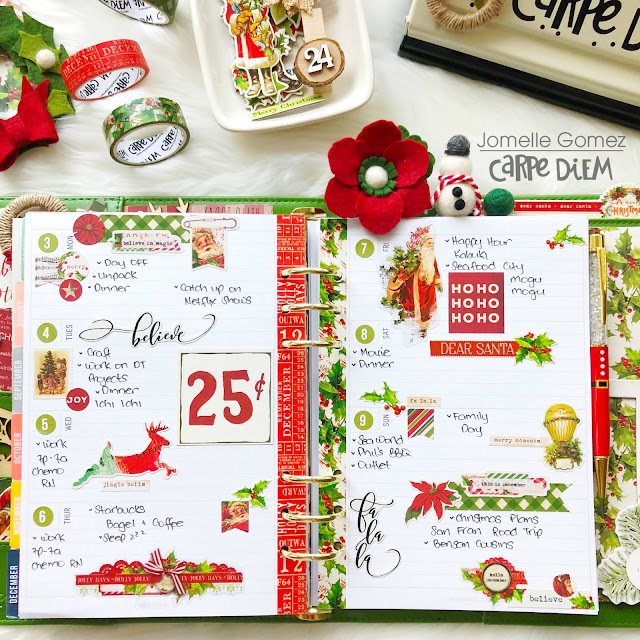 Inside my December Daily insert, I’ve used one of the free December printables available this month on the Simple Stories website. The countdown one is perfect to kick off my December Daily. The chipboard wreath I’m using to count down is a sticker but I left the sticker backing on it and then added repositionable double-sided tape so I can move it around. 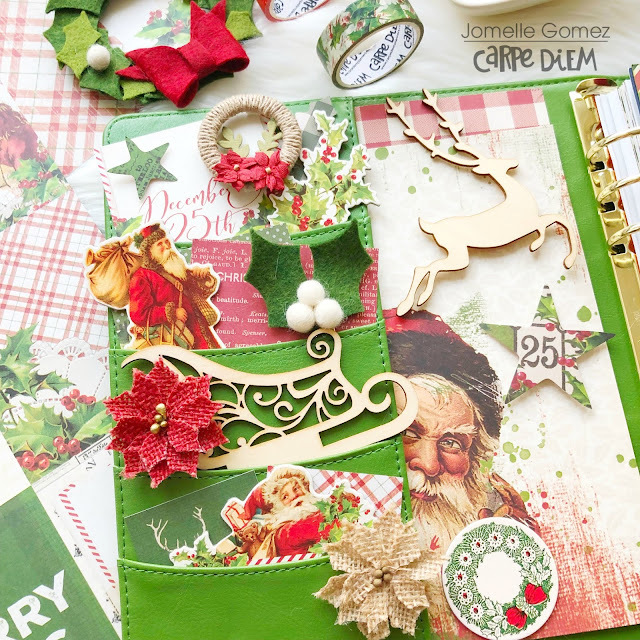 I’ve used items mostly from the Merry & Bright collection to decorate the inside cover of the insert. 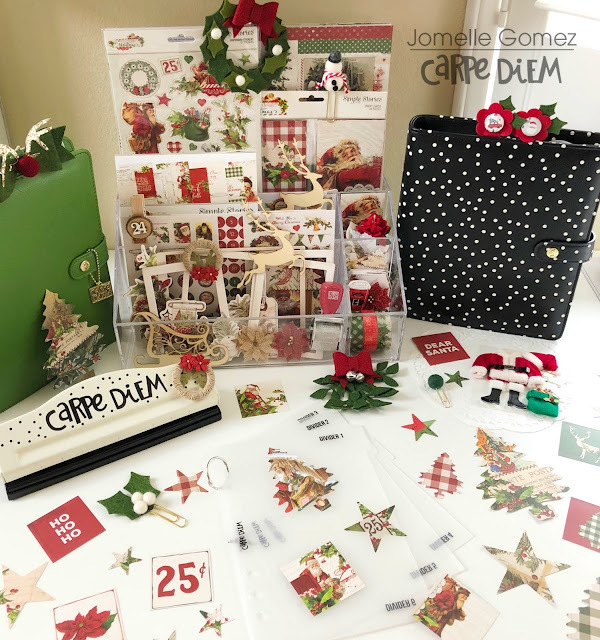 You can see how the Merry & Bright collection has a lot of those softer green and red hues that I also love in the Freezin’ Season collection. I am planning to type up my “Reason Why” and add it to this page. What is your favorite seasonal collection from Simple Stories this year? Are you using it in your planner or to document memories, or both? Tag me on Instagram if you’re participating in December Daily this year. I truly love seeing how others plan and document the holiday season. Stay tuned on all the Simple Stories and Carpe Diem Planners social media channels for lots more creative inspiration to inspire your holiday season! Hello everyone!! 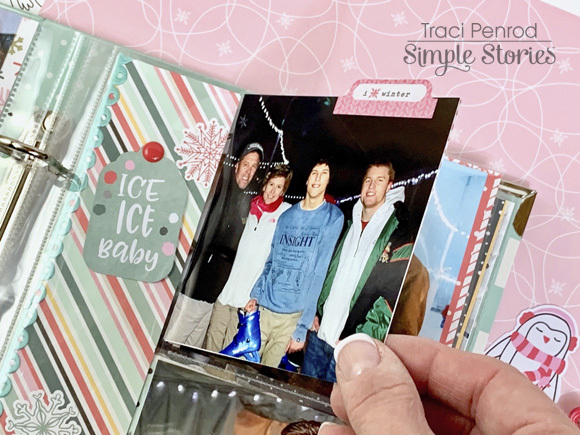 Jackie G here today on the blog to share a couple fun, yet simple winter cards with you using the Freezin’ Season collection!! Living in southern Arizona, we don’t get to see frost or snow (except for those “very” rare occasions) so this collection is lots of fun to work with. I get to be festive without being cold!! I decided to create a couple winter themed cards so I could use them for an occasion. Whether they be for Christmas, to celebrate a birthday, a friendly hello or whatever I need. Starting off with the first card I wanted to do something a little “off center” so chose to adhered my burlap background a little wonky. Using lots of foam adhesive to pop up my sentiment and penguins, they made this little winter scene pop!! It’s a chilly wonderland…can’t you feel it with this collection?? Again, using the chipboard stickers and bits and pieces to create this mountain scene for my little polar bear friend. Brrrr….my favorite out of the bunch, yet so simple!! There is really nothing to this card except more chipboard stickers, bits and pieces and LOTS of dimension!! The pink “Hello Winter” paper really makes this card so soft and elegant. Last, but not least a fun little winter scene. I used the long chipboard village piece to set the scene. It wasn’t quite enough for me and I really wanted some added interest so I used an additional winter house to pop up in the front. I hope you have enjoyed these winter themed cards. They are so incredibly easy…you can make them too!!!! Plan With Me Using The Essentials! Hey planner friends! 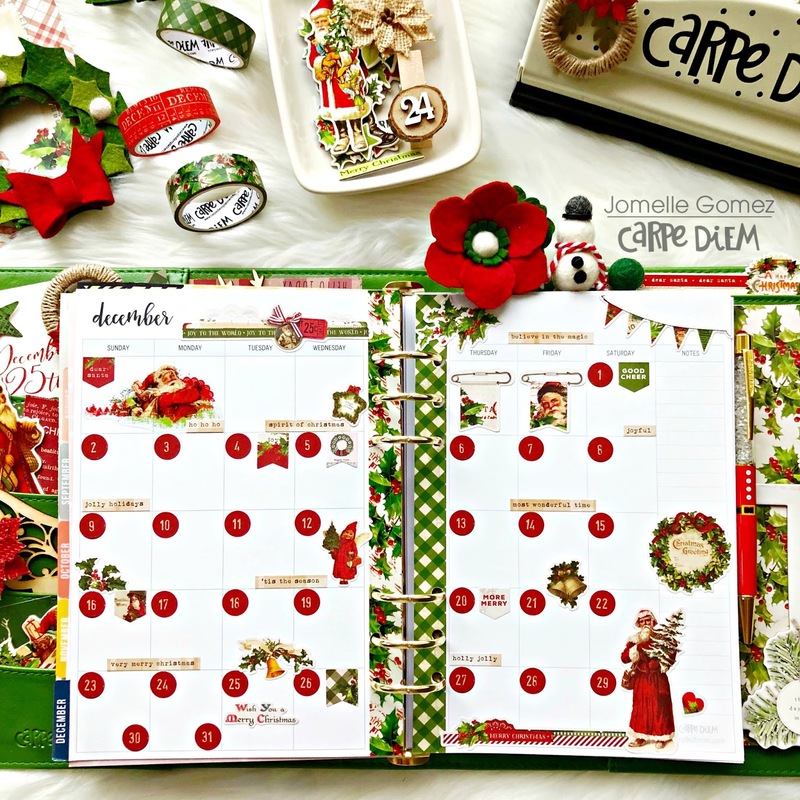 It’s Rachel again and I am back on the blog to share a little “plan with me” using my favorite basic essentials on the Carpe Diem Planner website. Ah…nothing more satisfying than a fresh new week! First up, I use the clear number stickers to add my dates in my weekly planner insert. If you are like me and are a planner opportunist (hee hee, planner peace?! Try all the planners for me, please!) then having undated pages is great because you can not only change up the type of inserts, but the size of inserts, too. With so many beautiful types and sizes of planners, it seems a shame to be tied to just one! I always have a set of clear number stickers stashed in the pockets of all my planners so I jump into that particular planner any time I want. A quick tip: I use a pair of tweezers to help with the placement of these stickers. Once the week is dated, it is time to add my plans! This is where the FUNtioncal planning comes in. I like to use a mix of icons, boxes and headers to add my plans and these three stamps set help me do that. I’ve mentioned my love of stamping before (see this post!) and for this week, I loved getting to use a color palette that matches the fun decorative elements. Some planner girls make awesome “before the pen” spreads, but I tend to write in my plans right away. If plans move or change, you can just cover it with washi or put a sticker over it! After the plans are all laid out and penned it, I spend some time decorating! This part has no function, but certainly helps me scratch the creative itch with no pressure to make it “perfect”. I decided to use washi and stickers from the Merry and Bright Collection, along with few stickers from the awesome Planners Basics sticker tablet. If I could only have one sticker tablet, it would definitely be this one. All the different colors gives the option to decorate with so many different color palettes. Once I’m done planning, it’s time put my insert back inside my decorated insert cover. I love making insert covers because it allows to switch up my setup without having to change my inserts. Now, everything goes back in my travelers notebook. I can’t help but take a moment and admire all of the delicious, decorative goodies in my pockets and on my travelers notebook covers. This set-up is gives me all the heart eyes, and motivates me to open my planner and get things done! Thanks for stopping by and I hope you enjoyed my walking through how I plan my week in my travelers notebook. Do you have a process for planning out your week? Leave a comment here on my instagram and tell me about it! Hello! Jana Eubank here. 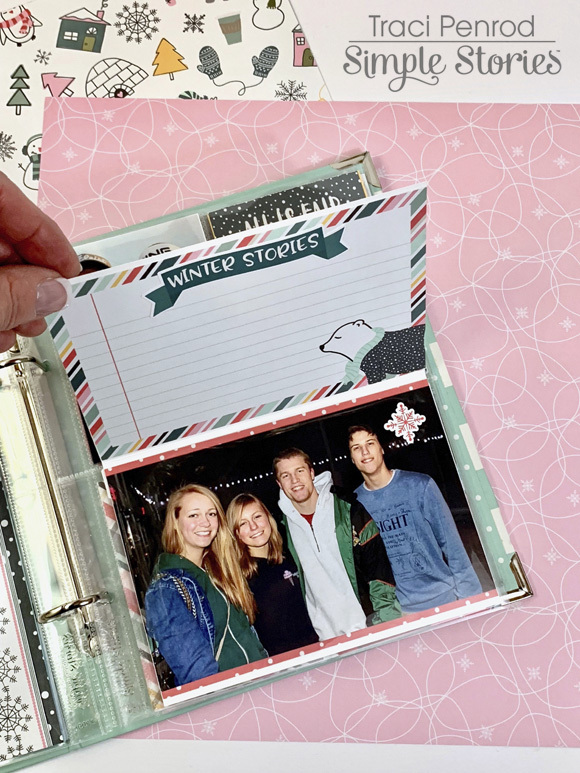 Traditions are an integral part of our Christmas celebrations each year and definitely deserve a spot in your family album. The Simple Vintage Christmas collection has that classic Christmas vibe that allows these memories to shine. I love the images of Santa in this collection! Look how cute this die cut is ... he is definitely keeping an eye out to see who is being naughty or nice! I also really love the greenery images from this collection ... especially the holly and berries. I made sure each embellishment cluster on this page had holly, tying them all together and adding a cohesive look to the design. The chipboard Layered Frames for this collection are a must-have! The layered look will effortlessly make your main photo the star of the show! Hello friends, it’s Kylie here with you all today. Do you like making lists? Better yet do you like checking them off? I am a huge list maker and today I thought I would share with you how I have been making lists for December in my Typewriter Circles TN, as well as how I have set it up using the ‘Freezin Season’ collection by Simple Stories. 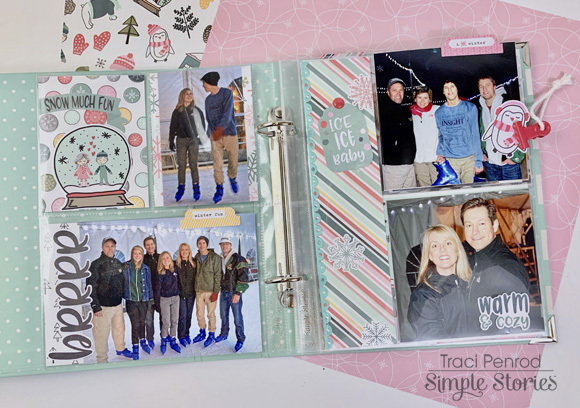 I have been using the ‘Daily’ Traveler’s Notebook Inserts as well as the ‘Lined’ Traveler’s Notebook inserts.The ‘Freezin Season’ collection is a cute Wintery themed range but for my TN, I love how I was able to use it for Christmas as well. I love this open view on my desk.The colours are SO pretty and really ‘Pop’ against the soft aqua of my TN. I love to cut apart the 4 x 4 and 3 x 4 element sheets to add into my pockets.These pockets are also great for storing stickers, washi card or anything else you need for planning on the go. I also created some covers to wrap around my TN inserts. I added some cute die cuts and stickers with foam tape for extra dimension. The pom pom trim was in my ribbon stash and I thought it looked like little Snowballs! Here is a closer look at the covers I made laying flat. I love how they look inside my TN wrapped around the inserts.I’ve added some detailed outlining to my covers using a black felt tip pen. Its nice to add a border or to highlight a quote. How cute are these 4 x 6 cut apart sheets?? 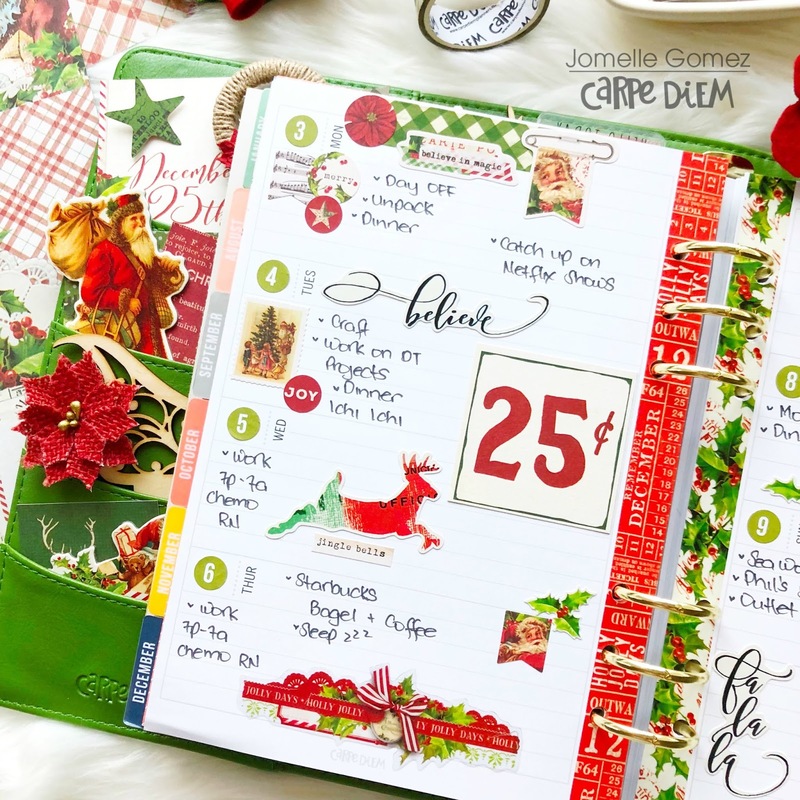 Here is a look at one of my list pages in the ‘Lined’ TN insert.I have created it for keeping track of my Christmas cards. The washi tape I have added down the center is purely for adding colour. Another page created for keeping track of Christmas gifts. I’ve cut apart the ‘Snowed In’ paper and added a small border to either side of my page. I don’t know about you but I always forget what I am shopping for unless I write a list of everything I need. I’ve added a shopping list page as well, using my Letter Punch board to create my page titles. And finally, I wanted to share my ‘Daily’ TN inserts. These are my go-to when life is so busy. It is set up one day on two pages with a timed column. I love to jot down everything for my day on these! I hope you have enjoyed seeing my Traveler’s Notebook set up today! Jomelle here today and I am sharing with you my Christmas Set Up in my A5 Planner. First, I needed to decide what planner to use to go with the Simple Vintage Christmas collection. I couldn't decide between the Clover or the Black Speckle. Which one would you pick? I actually love showcasing this collection. I wanted to keep it just for display but I also couldn't wait to use this for my set up. I decided to use the Clover A5 Planner. I think it goes so well with this collection and it brings out the red color but doesn't over power it too much. I wanted to do some layering to create my dashboard. It used different prints of the paper and I used some of my punches and dies to add finishing touch to my layering. I found these wooden sleigh and reindeer from my stash and I thought it goes well with the vintage theme. As usual, I used my pockets for more decorative purpose than functional. December "Before the Pen" I love how the 4x6 stickers came with numbers that you can use for dates. It comes in red and green color. I worked around it to finish the rest of the page. Thank you for taking your time to view my blog. Have a Happy Holidays! Hello! It's Jennifer here today to share a layout I created with the beautiful Merry and Bright collection! I'm a big fan of the whimsical prints with the traditional red, green, and white Christmas colors! And I love that there is a black and white buffalo plaid print! I scrapped a photo of our sweet pug, Max, from last Christmas. We lost him this past fall so it goes to show that taking photos is so important! I started with kraft cardstock followed by adhering a 11x11 inch piece of the B side of the 4x6 Horizontal Elements. I place strips of the beautiful plaid of Celebrate the Season as well as Holiday Memories across the bottom. I affixed my photo to a white piece of cardstock fashioning it to look like a Polaroid frame. For my title, I used the cute "have yourself a merry little christmas" sentiment from the 6x12 Chipboard. You can also spy some of the coordinating Washi Tape underneath that comes with the collection! Just under the corner of my photo, I adhered one of the journaling spots from the Bits and Pieces pack. I then affixed this cute red truck chipboard circle. to accent. Across the middle of my layout, I wanted to create a "clothesline" of sorts to tie in some of the die cut embellishments as well as a couple of the Tags and Frames. Using pop dots, I affixed my embellishments to the page while running bakers twine along the tops. From my stash, I added mini clothespins to give extra dimension. Here is one of the tags from the Tags and Frames pack along with a red flower I attached to the top with my clothespin. I also layered the cute "peace love joy" tree which is also found in the Tags and Frames. At the bottom of my Santa tag, you can also see some stamping with the Classic Christmas Roller Stamp! At the top of my page, I utilized a cut file to create a border with different patterns (Snowflake Border #69597). Some of the pieces, I layered two different papers, while others are a single pattern. I affixed smaller die cuts from the Combo Sticker Sheet as well as 6x12 Chipboard. Thank you for reading the blog today! Visit the Products page to see this collection in its entirety as well as the rest of the awesome Simple Stories lines! Have a great day!